Our product range includes a wide range of braided hose. Our braided hoses are in demand in the market for their excellent performance and ability to deliver excellent results in critical areas of operations. Our high quality Braided Hose do not elongate axially; a common problem with most brands on the market. 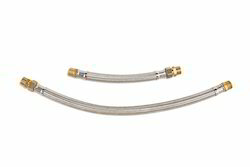 Our braided hose has an external layer of stainless steel wire to make the hose pressure compatible. Sometimes two or even three layers of braiding are provided for high pressure applications. The braiding is highly flexible and follows the movement of the hose.